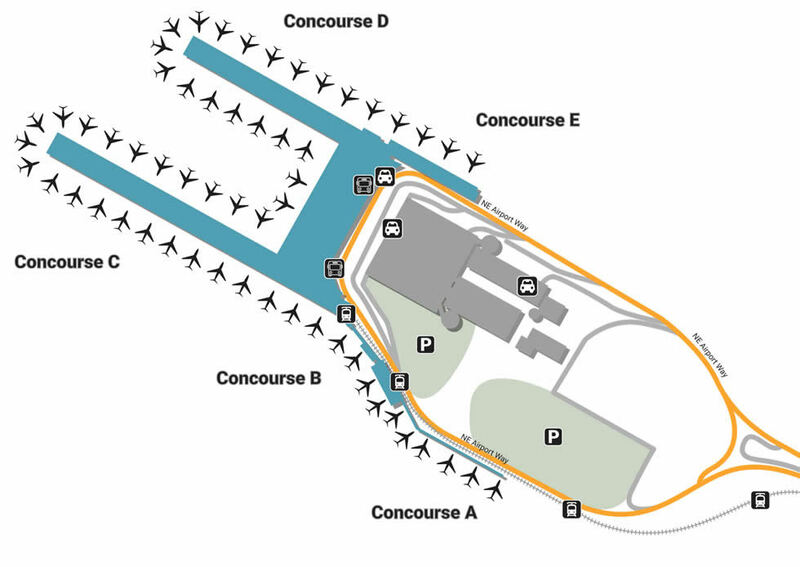 Getting from your hotel to Portland International Airport can be easy with our local providers and terminal maps giving you an overview of the airport. Portland is the largest city in Oregon, offering guests a window into one of the most eco-friendly cities as well as offering a hotbed of innovative music activity. Enjoy the scenery as soon as you arrive to Portland International Airport, a facility that’s second-to-none in terms of quirky restaurants, trendy shops and exemplary service that makes every moment sweet. There are too many important things to do to worry about something as small as parking. Get the little things taken care of by dropping your vehicle off at one of the four lots. If you are only staying for a few hours, head to the Short-Term Lot for hourly parking as well as the closest convenience to the main terminal. The Long-Term Lot is located right behind the Short-Term, offering much better deals on daily rates while still offering the same practicality. If you’re leaving for an extra long time, utilize the Economy Lot, located at the corner of NE Airport Way and Highway 205. There are a variety of services that make hours pass like wind blowing over Oregon’s tree tops. One of the most unique is the art program, which brings interesting installations and local musicians to help ease difficult transitions. No airport is complete without specialty services, whether it be the Pet Relief area near Gate C1 or the beautiful Lactation room near Gate D2. If you need to connect to someone very far, utilize the free Wi-Fi located in every waiting area. Portland International is also appealing to business travelers for its upscale conference rooms that come with gourmet catering and the latest technology. With five massive terminals that connect the airport’s underbelly, grabbing a souvenir or picking up a new bag is as easy as walking. If you’re in need of some relaxation near Terminal C, visit The Dragontree Holistic Day Spa (C12) for an ethereal sanctuary. If you find yourself idle in Terminal A, pick up a specialty gift at the Northwest Travel Mart (A3). There are also a variety of shops in the Connecting Terminal Shopping Strip near baggage claim, offering heart-warming gifts from The Real Mother Goose and locally-produced splendor at Made in Oregon. From the high-speed gourmet at The Market (D6) to local digs like Rose’s Restaurant & Bakery (D5), you’ll be surprised at the endless choices waiting around every corner. For a more classic scenery, try Henry’s Tavern (C11), or enjoy a locally-brewed cup at Portland Roasting Coffee, located next-door. Eat farm-to-table as soon as you pass the security checkpoint, enjoying The Country Cat Dinnerhouse & Bar for near Terminal E. Walk a little further, away from the hustle, and enjoy a quiet dinner at Laurelwood Public House & Brewery (E2/E3).